The many layers of volcanic build up of Santorini. 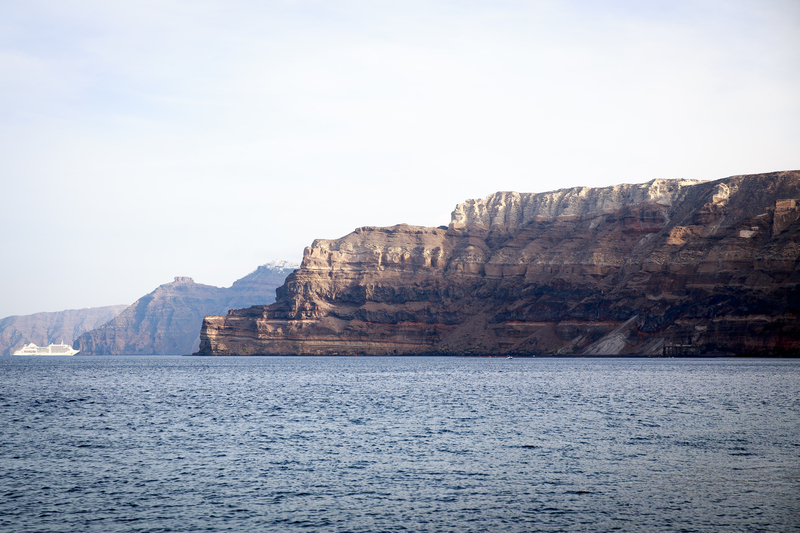 This morning we awoke to the island of Santorini protruding from the ocean outside of our stateroom. Right off the bat, you notice the towering cliffs on the west side of the island made of various layers of volcanic activity. A quick tender ride in and we are at the port to catch a bus up the switchbacks to the top. Since we were on a shore excursion we had busses to get us to the top. If you weren’t on an excursion you had 3 options, cablecar, walk 600 steps or take a donkey. Walking and taking a donkey weren’t advised as they use the same path, and well, donkeys don’t use toilets. So the trail might have some land mines to dodge. From sea level to the top is almost 700 feet. At the top is the capital of Santorini, the village of Fira. People were swarming the streets as we were one of 4 cruise ships making the stop today. Our bus took us to the eastern side of the island on the way to our first stop, the village of Oia(pronounced “Eeeyah”). 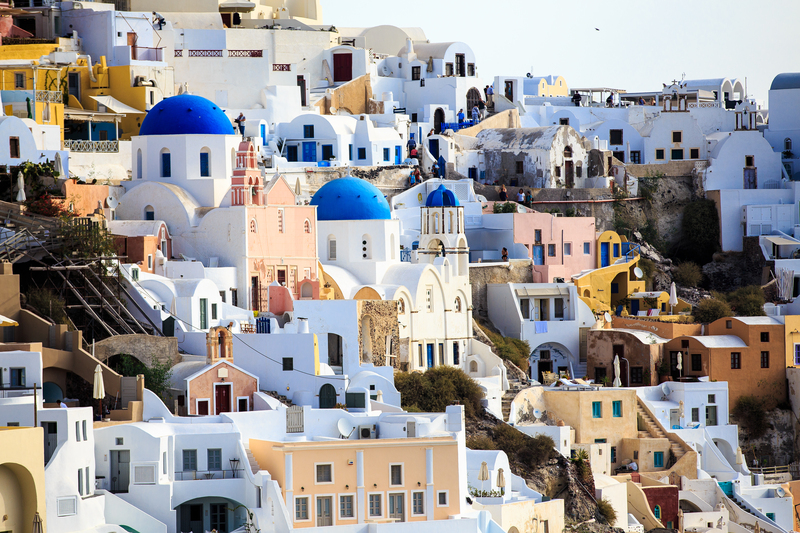 If you’ve seen photos of Santorini, chances are, they’re in Oia. The bleached white buildings with bright blue domed churches. 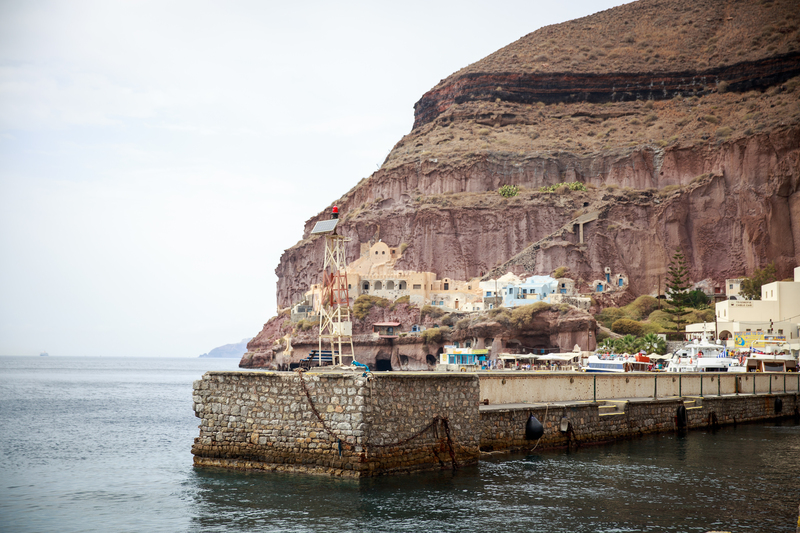 Santorini itself, is the result of build up from volcanic eruptions. There is very little rainfall on the island in the run of a year, thus very little greenery. The hills vary in color from red volcanic to black basalt to white pumice. Due to the lava, there is very little agriculture on the island, except for some grapes and a few trees here and there. More on the grapes later. After we arrived in Oia, a quick walk to the village square we were off on our own to explore, take pictures and overall just be in awe of everything. The views are amazing and the vibrant colors just pop out from the drab lava hillside. Although I had an expectation of what it would be, and what it actually was, these were 2 completely different things. It is gorgeous, but there aren’t as many blue domes as I had originally thought. Don’t get me wrong, I was blown away by everything, but I expected there to be more. We made our way out to a point with an amazing panoramic view of Oia. One thing to note were the “gypsies” as our guide put it, trying to sell you things. They all had the same signs and same packs of tissues stating they were needing to buy medication for their husbands. You also have a trove of cats roaming freely around the “streets”. Oia is the popular wedding destination and in the hour or so we had in the village, we saw several brides having photos taken. The backdrop, no matter where you go in the village, is stunning. From the bright white buildings and the blue domes to the many alleyways, there are unlimited places for photo opportunities. After Oia, we headed back through Fira for our next stop. 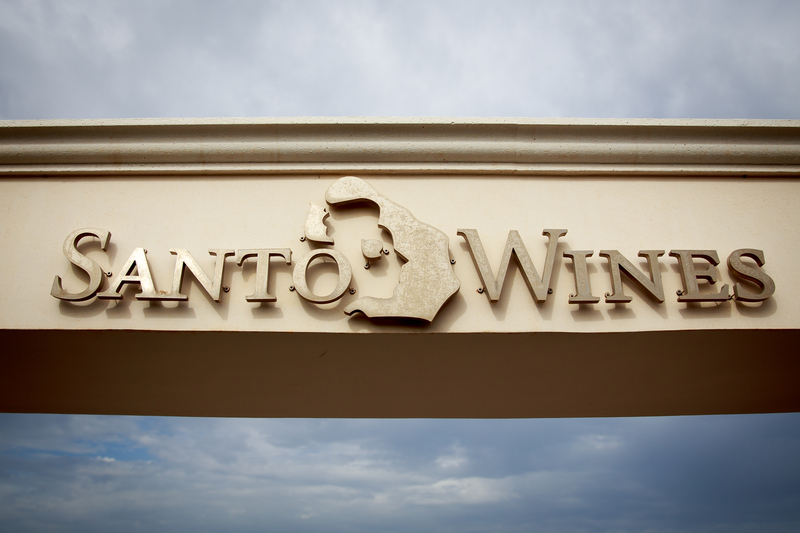 Santo Winery. On the way into the winery, you notice the low growing grape vines, almost weaving a bowl. Due to the lack of rain, the grapes grow low to the ground. The wine produced was great. We sampled 3 types of wine, a red, white and dessert variety. If I’m being honest, I’m not a wine guy. Though if I do drink it, it’s usually a white. Which their white was great, resembled a Pinot Grigio. The red was similar to a merlot and very dry. Greece is famous for it’s dessert wines, a sweeter red variety. Sweet is one way to put it. Also sickly sweet is another. If that’s you’re thing though, you’d enjoy it. The wines were so good that we had some shipped home for us. 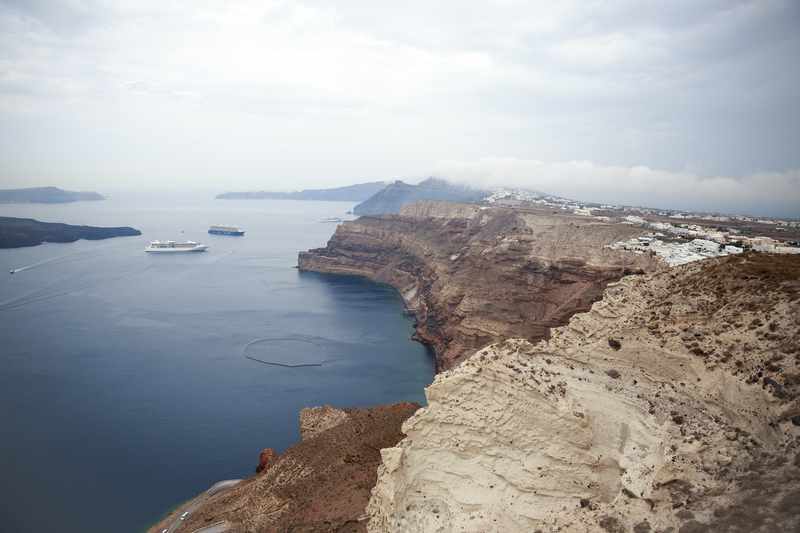 We enjoyed the view from the winery tasting area for a bit and then headed to the bus for our ride into Fira again. Getting hungry we found a Greek takeout and had a gyro(me) and Falafel(Elise). With a soda and a bottle of water it was only 7 Euro. Seriously, the portion size was huge and both were delicious!! With a full stomach we ventured out to do some shopping for souvenirs. Greek olives for my father, pistachios for the father in law and a Santorini Brewing Company Red Donkey for the wife and I as we walked around town. Possibly one of the greatest red ales I’ve had. That is the other great thing, you can get a beer and walk around drinking it. Before heading for the cable car for our ride to the port we ventured up the hill to the Catholic Church of St John the Baptist. A beautiful old church with a convent next door provided a nice escape from the hustle and bustle outside. We made our way back to the square to catch the cable car. In line we were met with another “gypsy” asking for donations while her (I’m assuming it was hers) daughter was bouncing around. About 20 feet up the line was a local boy playing the accordion and he was cleaning house with donations from those waiting in line. A quick and VERY steep ride down in the cable car, we boarded the tender and made our way back to the Rhapsody. Arriving in our room we had a bottle of champagne waiting for us compliments of AAA and Royal Caribbean. A quick dip in the pool to cool off we came back to enjoy a glass of bubbly before dinner. After dinner we made our way to the top of the ship as we left for our next stop. Athens. 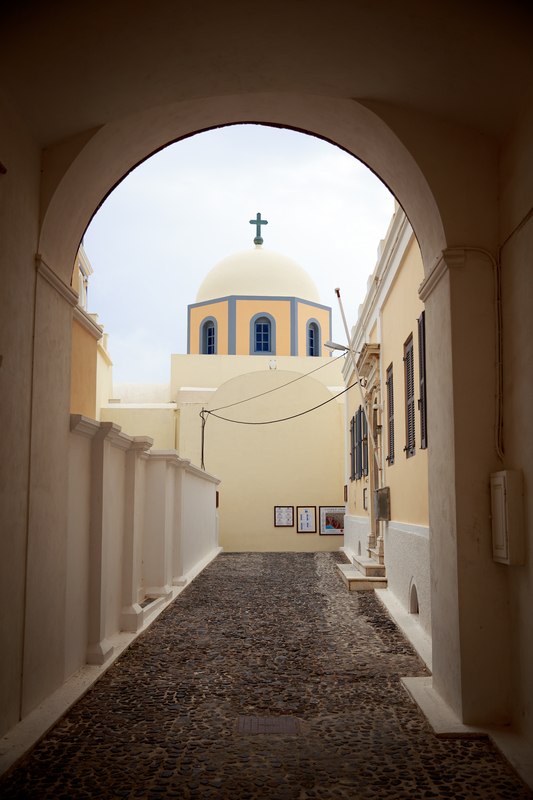 One of the famous blue domed churches on Santorini. The famous donkey of Santorini.